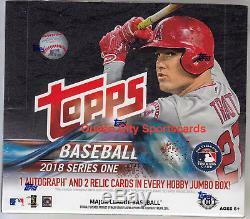 2018 Topps Series 1 Baseball Factory Sealed Jumbo 6 Box Case. THIS LISTING DOES NOT INCLUDE ANY SILVER PACKS. Thank you from Queen City Sportscards. Configuration: 6 jumbo boxes per case. For 67 consecutive years, Topps has commemorated America's pastime like no other. The 2018 season will officially arrive with the launch of Series 1! Look for all-new inserts, autographs and relics with additional parallels throughout this iconic release. 1 AUTOGRAPH & 2 RELIC CARDS PER HOBBY JUMBO BOX PRODUCT DESCRIPTION BASE CARDS 350 BASE CARDS Featuring Veterans, Rookies, Future Stars, Team Cards, League Leaders, World Series Highlights and Combo Cards. 350 PARALLEL CARDS - Rainbow Foil Parallel - Gold Parallel - Sequentially numbered to 2018. Vintage Stock Parallel - Sequentially numbered to 99. Independence Day Parallel - Sequentially numbered to 76. Black Parallel - Sequentially numbered to 67. HOBBY & HOBBY JUMBO ONLY - Mother's Day Pink Parallel - Sequentially numbered to 50. Father's Day Blue Parallel - Sequentially numbered to 50. Memorial Day Camo Parallel - Sequentially numbered to 25. HOBBY & HOBBY JUMBO ONLY - Platinum Parallel - Numbered 1/1. Printing Plates - Numbered 1/1. INSERT CARDS TOPPS SALUTE With an all-new look, these cards pay tribute to key celebratory days during the baseball season such as Mother's Day, Father's Day, Memorial Day and Jackie Robinson Day. Also included are the top Rookies and the game's legends. And find these Topps Salute Parallels... Blue Parallel - Black Parallel - Sequentially numbered to 299. Gold Parallel - Sequentially numbered to 50. Red Parallel - Sequentially numbered to 10. Platinum Parallel - Numbered 1/1. SUPERSTAR SENSATIONS These artist-inspired cards capture the brightest players in the game. MLB AWARDS Pays homage to the various 2017 award winners including MVPs, Cy Young Award Winners, ROYs, Silver Sluggers and best fielders. 1983 TOPPS BASEBALL Topps celebrates the 35th Anniversary of this iconic design that featured the rookie cards of Hall of Famers Tony Gwynn, Wade Boggs and Ryne Sandberg. AUTOGRAPH RELIC CARDS TOPPS REVERENCE AUTOGRAPH PATCH CARDS The collector-favorite high-end insert is back! HOBBY & HOBBY JUMBO ONLY - Gold Parallel - Sequentially numbered to 5. MAJOR LEAGUE MATERIAL AUTOGRAPH CARDS Sequentially numbered. Red Parallel - Sequentially numbered to 25 or less. WORLD SERIES CHAMPION AUTOGRAPH RELIC CARDS Sequentially numbered. POSTSEASON PERFORMANCE AUTOGRAPH RELIC CARDS Sequentially numbered. AUTOGRAPH CARDS TOPPS SALUTE AUTOGRAPH CARDS Sequentially numbered. WORLD SERIES CHAMPION AUTOGRAPH CARDS Sequentially numbered. POSTSEASONTM PERFORMANCE AUTOGRAPH CARDS Sequentially numbered. MLB AWARDS AUTOGRAPH PARALLEL CARDS - Sequentially numbered. CUT SIGNATURE CARDS - Numbered 1/1. 1983 TOPPS BASEBALL AUTOGRAPH CARDS Including autographs from the biggest stars in the game. Black Parallel - Sequentially numbered to 99 or less. Gold Parallel - Sequentially numbered to 50 or less. HOBBY & HOBBY JUMBO ONLY RELIC CARDS WORLD SERIES CHAMPION RELIC CARDS Sequentially numbered. Red Parallel - Sequentially numbered. POSTSEASON PERFORMANCE RELIC CARDS Sequentially numbered. IN THE NAME RELIC CARDS Featuring the name letter patches from 2017 All-Star jerseys. HOBBY & HOBBY JUMBO ONLY SKETCH CARDS Here's your chance to own a piece of original art on a 2.5 x 3.5 inch card. HOBBY & HOBBY JUMBO ONLY MAJOR LEAGUE MATERIAL RELIC CARDS - Black Parallel - Sequentially numbered to 99 or less. HOBBY & HOBBY JUMBO ONLY COMMEMORATIVE RELIC CARDS MLB SPRING TRAINING LOGO PATCH CARDS Commemorative relics featuring the all-new 2018 NL and AL Spring Training Logo patches. HOBBY & HOBBY JUMBO ONLY - Black Parallel - Sequentially numbered. Gold Parallel - Sequentially numbered. Autograph Parallel - Sequentially numbered. MLB ALL-STAR GAME MEDALLION CARDS Commemorative medallions highlighting the AL and NL players selected for the 2017 MLB All-Star Game. Black Parallel - Sequentially numbered. If you do not receive the per box hits described above, you must directly contact Topps for replacements, as there is nothing I can do once the case has been opened. Please contact me for any additional information or photos. The item "2018 Topps Series 1 Baseball Factory Sealed Jumbo 6 Box Case" is in sale since Monday, June 4, 2018. This item is in the category "Sports Mem, Cards & Fan Shop\Sports Trading Cards\Baseball Cards". The seller is "qcsportscardsnet" and is located in Charlotte, North Carolina.